This suit is one of the first designs I fell in love with when I became obsessed with sewing for Gene. I found this picture in a library book years ago. I believe this is from John Peacock's 20th Century Fashion: The Complete Sourcebook. 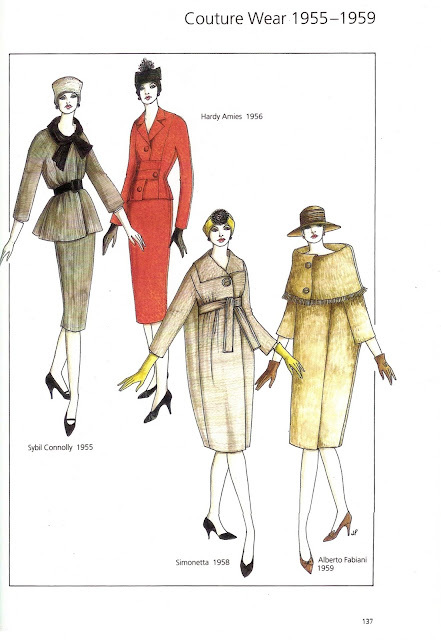 Hardy Amies was a British designer who designed for Queen Elizabeth. I searched the internet high and low to find a photograph of this suit, but I have not found one yet. This was my first attempt back in 2006. It fits the Tonner dolls much better than Gene. Last year I redesigned the pattern to fit Gene better. I made it out of silk noil. Noil is one of my favorite suit fabrics to work with. It gives the look of wool without the bulk. I also made it in navy noil. While I was working on the red and navy suits, it occurred to me that this is a great basic suit pattern. I wanted to see what it would look like without the front straps, so I made the pattern up in a green noil without the straps. I was honestly surprised how much I loved it. The color is perfect with "Cocoa Crisp's" green eyes. My original suit on Brenda Starr. Just for fun, the hat is a pin from JoAnn Fabrics.